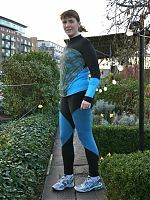 It feels like I’ve been talking about sewing my running gear for ages now, but I think that’s just because anything self-drafted and a bit custom tends to take a bit more time and head space than my average project! But I’m happy to report that two out of three of my first pieces are finished now (the sequin vest is awaiting more coverstitch binder practice, but more on that next week). Both of these pieces are heavily modified (bordering on self drafted) from the originals, but the leggings are based on the Jalie 3135 skinsuit pattern and the top started life as my basic KnipMode long sleeved teeshirt. 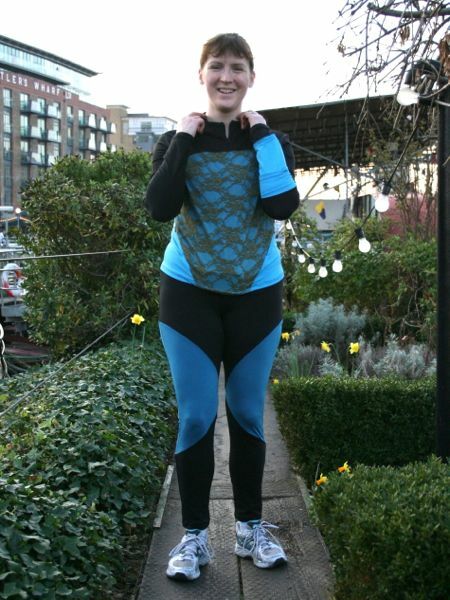 You’ve seen a sneak peek of the leggings earlier, but now you can see them paired with my long sleeved top, though the different turquoise shades mean I probably won’t wear them together often in real life. 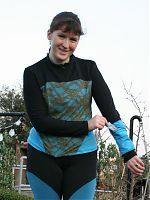 The long sleeved top needs three different fabrics in order to get a contrast on the upper body and again at the hip pockets. 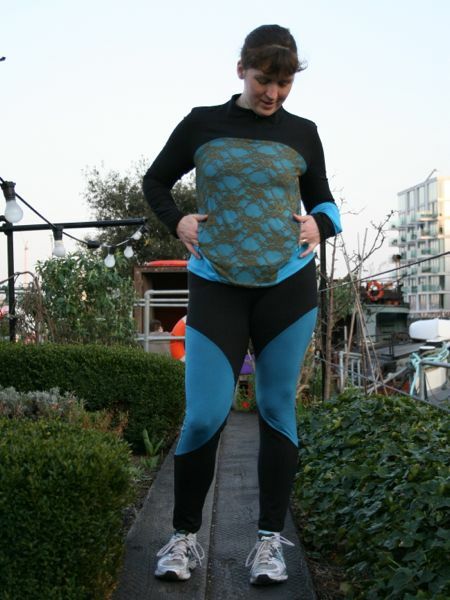 So I’ve used the black supplex for the top and sleeves, leftover turquoise for the lower back (which wraps around to the front hips), and the same turquoise but overlaid with olive green stretch lace for the front body. 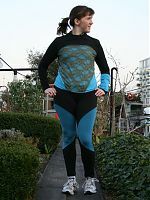 The leggings use black supplex and dark turquoise “silk touch” lycra for the contrast panels. 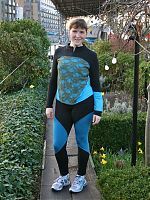 You can see my cool seaming on the thighs below, and in getting design lines to match up, I favoured the outer seams matching. 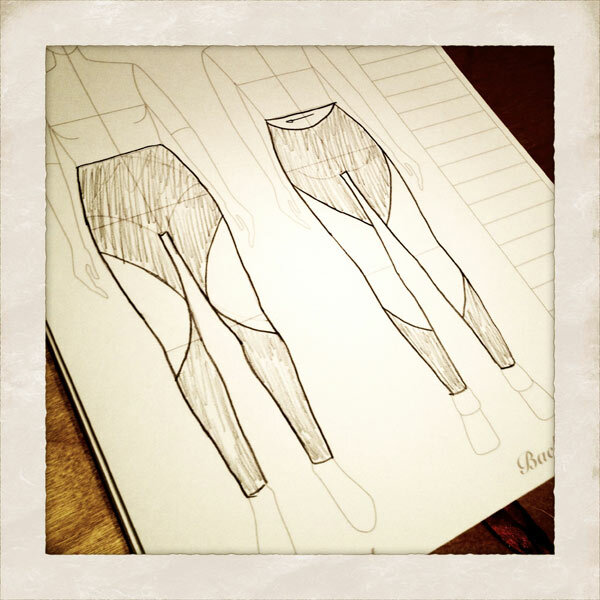 It means it’s not quite as cool on the inner thigh seams, but it means I get a nicer overall panelling. When I started modifying my basic teeshirt pattern, I decided I wanted a short, integrated collar with a zipper, so that’s exactly what I did! 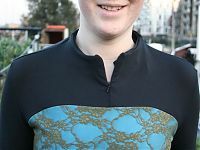 I added a bit of curve and height to the neckline, then added an invisible zipper in the centre front, which extends down to the yoke seam. Oh, and I’ve got a facing on the inside, which is just stitched down at the shoulder seams. The collar is narrow enough that this is plenty enough to keep it flipping out. 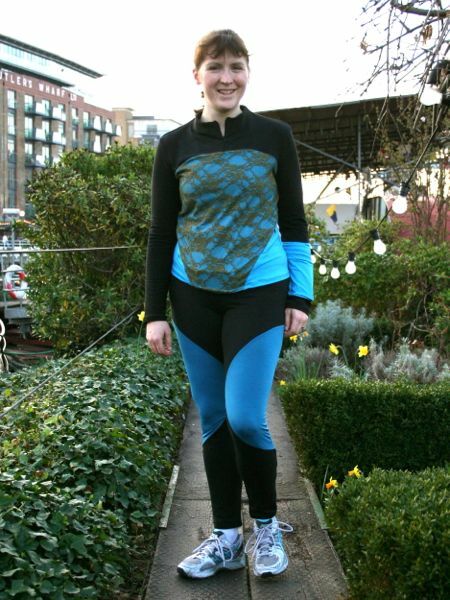 The one thing I absolutely need in running tops are plentiful pockets! 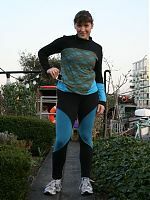 When I go out, I carry my iPhone (necessary since I use a GPS tracking app for motivation and speed feedback), my Oystercard (so I can hop on the tube or bus if I injure myself), some change (there’s only one free toilet along my route), and if it’s a weekend long run, two packs of gels or Shot Bloks. And that’s the minimum! 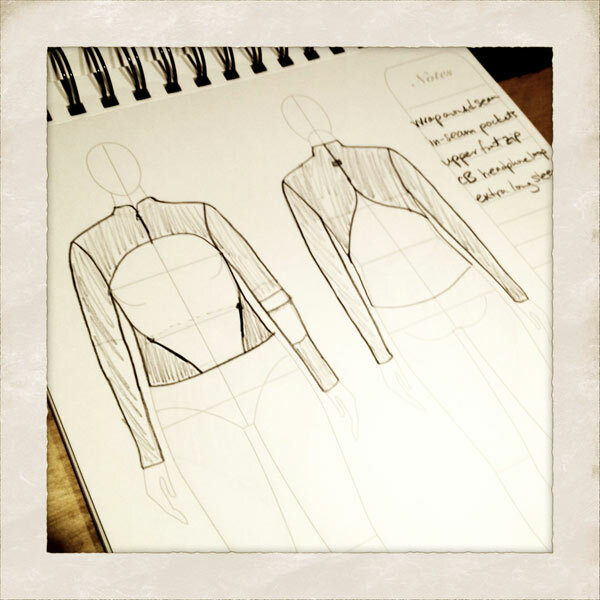 So when I was drafting the lower front seams, I was doing this firmly with pocket openings in mind. So I’ve inserted an invisible zipper on both sides, which lead into one, combined “kangaroo” pocket. My next version will have some modifications, though, because the pocket openings are just a bit too narrow to easily get my hand in, and I really need to make the waist/hip area much tighter-fitting, because if I put my phone in the front pocket, there’s way too much bouncing going on. But it’s still useful for lighter items, like the gloves I shoved in there midway through Tuesday night’s run. 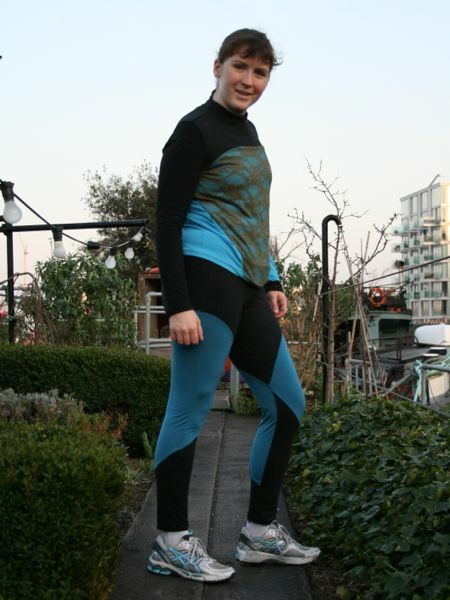 Here’s the back view of my running gear. I wanted the back and sides to be just as interesting as the front in both pieces! In addition to the front pouch pocket, I also wanted a dedicated sleeve pocket purely to stash gels for long runs and races. 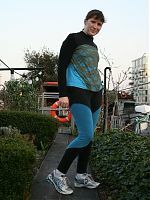 But putting it on my left lower arm, I can easily get into it with breaking stride, or fumbling with an invisible zip. 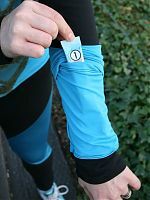 The gels are fairly lightweight, so they don’t bounce around, and the pocket is tight enough that there’s no danger of it bouncing out of the envelope-top opening of it’s own accord. Illustrated above with one of the free “tea peach” flavoured gels I got in Paris, but I’m usually a Torq or Shot Blok girl! I think, in future, I’d make this pocket in the same colour as the sleeves. In my head, the contrast pocket looked very cool, but I think I’d prefer it to stand out a bit less in real life! 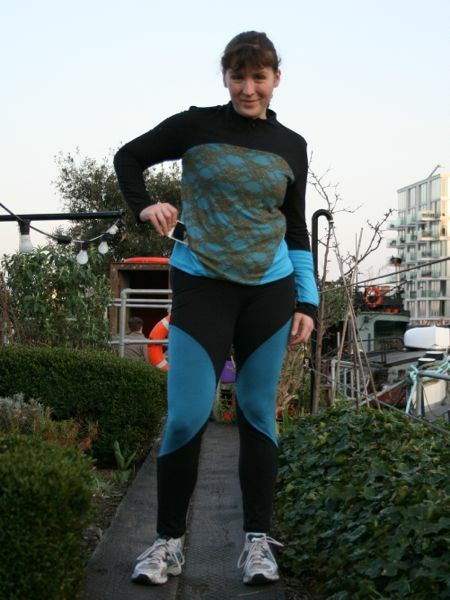 And finally, the least exciting photo – a shot of the waistband on the trousers. 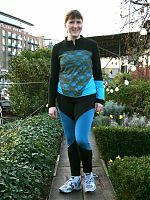 I used my go-to elastic waist treatment, where I overlock the elastic onto the inside waistband edge, then flip it inside again, then coverstitch along the bottom. It means you have zero elastic contact against the skin, and this has always served me well in the past. With long distance running, inner finishes that feel soft and fine under normal wear mean I come back after a two hour, 20+km run with big, red raw patches where the seemingly fine elastic has worn holes in my skin. There’s one particular sports bra which does this every time I wear it (unless I remember to use Body Glide on the area the elastic touches). 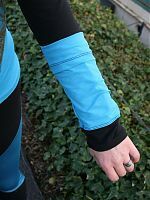 So I was very careful with this set to try and protect my skin, and I was quite nervous about the serger/overlocker seams causing irritation (most RTW running gear uses flatlock seams). Both pieces have been fine though in my ~8-10km test runs, but I definitely want to investigate my overlocker’s mock-flatlock feature in future. 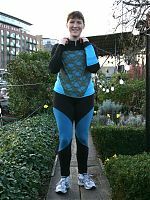 Also, to those of you I’ve inspired to start running, I highly recommend this newbie running post on the great new ladies running site, Spikes + Heels, which a running friend just started! Separator image Posted in Gallery and tagged with drafting, exercise, knit, top, trousers.